You “baby-boomers” and Beatles fans probably have a song with these words going through your mind now. You may not appreciate that, but I want you to reprogram these words from a worldly song to a calling from Jesus Christ to get back to where you once belonged! Getting away from God is a universal reality that happens to all of us at some time. It causes us to search for meaning and direction. Once you have had an intimate relationship with Jesus, being away from Him is a sorrowful experience. The joy of the Lord and of our salvation is gone. We wonder if it is possible to get back to where we once belonged. Simon Peter had this experience. He walked closely with Jesus. Yet, Peter denied the Lord three times during Jesus’ trial. Peter thought the relationship was over, so he returned to the fishing business. One day, the risen Lord was waiting for him and the other disciples on the shore of the Sea of Galilee. When they returned, Jesus already had breakfast prepared for them. The Lord came to Peter, restored their relationship, and encouraged him to go to work for Him. In spite of his faults and failures, Peter loved Jesus, and was not ashamed to admit it. The other disciples were listening to the conversation and benefiting from it, for they too had failed the Lord after boasting of their devotion. Sin separates us from God, but regardless of what you have done, no one needs to remain away from the Lord. He offers the same glorious possibility of restoration to everyone who has gone astray. After Peter’s restoration with Jesus, his joy returned. Nothing brings back joy any better than to be back where you once belonged with God, doing what He wants you to do. Sometimes we drift so slowly away from God that we don’t realize we have left Him. We become religious instead of intimate with Jesus like we were at first. Amidst our religious activity, we think we are pleasing God. This happened to a Church in Ephesus. This is a wake call from Jesus Christ to all Christians! You have lost your first love when the Lord points out the sin in your life, giving you opportunity to repent, and you refuse, continuing to do what you want. You hear the consequences of sin through the Word, but you think you are an exception. You say you love the Lord, but you are lying and deceiving yourself. 1 John 2:4-5 He who says, "I know Him," and does not keep His commandments, is a liar, and the truth is not in him. But whoever keeps His word, truly the love of God is perfected in him. By this we know that we are in Him. 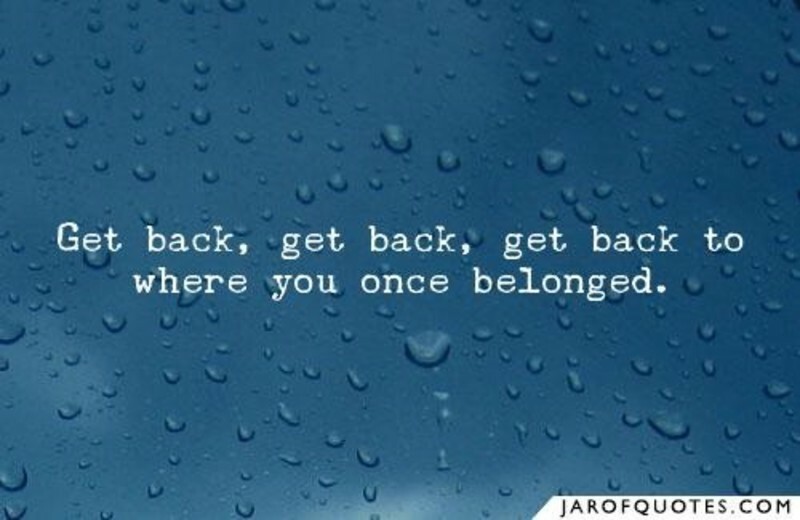 Maybe you know that you need to be restored, but you don’t know how to get back to where you once belonged. The first step in getting back to God is to recognize your sinful condition. God always has and still confronts sin in the lives of His people. Are you willing to admit your sin today? Some of you are simply denying your sin and telling yourself that you have a good relationship with God. Honestly, you care more about the things of this world than you do about God or what He thinks. If you are not as close to God as you once were, realize you are backslidden. You need to take the first step in getting back to where you once belonged with God by recognizing and admitting your sinful condition. The second step in getting back to where you once belonged with God is to reject your sinful condition. Don’t just mentally agree that you are a sinner! If you are living life your way and not God’s way, you are headed for serious consequences. The sin in your life also creates a barrier between you and God. That is why it seems God is not answering your prayers. You can’t live a life of sin and expect God to hear any prayer other than a prayer of repentance! So many people think because they aren’t hanging in bars or night clubs, running around on their spouses, stealing, or killing that they are not living in sin. Wrong! There is a more insidious and subtle sin that separates us from God. Too many Christians live inconsistent lives. They say one thing and do another. They live right for a while and then turn back to the old ways. This type of living brings God’s chastisement. Hebrews 12:6, 11 For the Lord disciplines the one he loves, and chastises every son whom he receives… For the moment all discipline seems painful rather than pleasant, but later it yields the peaceful fruit of righteousness to those who have been trained by it. Getting back to where you once belonged with God is not simply seeking relief from His discipline. If you are praying only because you are hurting from the discipline, it will not help you at all. You must come to a place where you recognize God is right, you are wrong, you are contritely sorry, and you reject your sin! Contrition carries the idea of being crushed with grief over sin. Once you come to a place where you truly recognize the gravity of your sin, then you must reject it from your life, and take the third step which is repent!! That means change directions; stop going your way, obey the Word, and get back to the Father, where you once belonged! Revelation 3:19 Those whom I (Jesus) love, I reprove and discipline, so be earnest and repent. Repentance means you start doing the things you did at first when you loved Jesus and desired to live for Him. This requires daily and moment by moment dedication now, because the “honeymoon” is over. You are now on the front line against the temptations of the devil. You see, when a person first receives Christ as his Savior, he experiences the delight of “first love” for the Lord. God’s Spirit witnesses with his spirit that he is a child of God, and this newfound relationship brings great joy. Like a new marriage (we are married to Jesus), there is a “honeymoon” period when everything is excitingly new. This exciting time lasts a short while and then our love and faith is tested. During these tests is when many shallow Christians fall away from Jesus. When a believer quits depending on God to meet his daily needs, quits reading his Bible, quits obeying, and quits continually praying, his love for Jesus grows cold. The joy of his salvation fades. Are you cooler toward God and less passionate about spiritual things than you once were? If so, recognize it, reject it, and repent. Forsake the thoughts, attitudes, and actions that have drawn your attention away from a wholehearted love for Jesus. Ask for God’s forgiveness and His grace to renew your love for Him. Then recall your salvation experience and repeat the “first works” you did out of love for the Lord. Obviously, from the definition of work, repeating the “first works” involves action. It is not something that happens without effort on our part or without grace on God’s part. “First works” refers to many key efforts designed to deepen our intimate relationship with God. So, what were some of our “first works”? There are many, but I will briefly describe five. 1. We had faith. We had confidence in Jesus Christ. This faith believes God can do anything. At first, we were persuaded that God is able. We trusted God to move our mountains. But then some answers to our prayers were delayed and we faced trials and sufferings. We began to doubt, and fear. Unbelief replaced our faith. Can we get faith back? Yes, if we admit our unbelief and ask God for help, for faith is a gift of God. Again, if we find ourselves lacking faith or with less faith than we used to have, we should confess our unbelief to the Lord, and ask Him to help us. After all, our faith is not faith in our faith, but faith in the Lord, who gave us faith in the first place. Ephesians 2:8-9 For it is by grace you have been saved through faith. And this is not from yourselves; it is the gift of God, not by of works, so that no one can boast. 2. When we were first saved, we walked in the Spirit and obeyed His voice. We pursued spiritual things, but later we drifted away from the Spirit and began pursuing worldly things. If anything in our life is quenching the Holy Spirit, we need to get back to where we belong by asking God daily to fill us with the Holy Spirit and begin obeying His voice again. Romans 8:5-6 For those who live according to the flesh set their minds on the things of the flesh, but those who live according to the Spirit set their minds on the things of the Spirit. For to set the mind on the flesh is death, but to set the mind on the Spirit is life and peace. Keeping our individual lives full of the Spirit will keep the church spiritual. Some churches get program oriented, some churches get over socialized, some churches become counseling centers or relief centers. But to be alive, the church must consist of Spirit filled believers. Then the church will experience faith, love, peace, joy, miracles, deliverances, praise, and true worship. Therefore, pursue the Spirit of God and all that He has for you. Don’t settle for religion. Don’t look for the easy way. If we aren’t careful, we will be like the young man who asked to marry the farmer’s daughter. The farmer replied, “If you can catch a bull by the tail, you can marry my daughter.” The farmer continued, “You can choose between three bulls.” Well, the first bull let out was big, had long horns, and was pawing the ground, so the young man let that bull pass. The next bull was even bigger and meaner looking, so he said, “I don’t want to mess with him!” The last bull was small, almost meek as a lamb, so he said, “That’s the bull I want!” But when the small bull got near him, he realized it had no tail! Sometimes to get what you want, you can’t look for the easy way, you have to grab on, hold on, and seek God with all your heart. Jeremiah 29:12-14 Then you will call upon me and come and pray to me, and I will hear you. You will seek me and find me, when you seek me with all your heart. I will be found by you, declares the LORD, and I will restore your fortunes and gather you from all the nations and all the places where I have driven you, declares the LORD, and I will bring you back to the place from which I sent you into exile. 3. Prayer is a way to seek God and become intimate with Him. Take time to meditate on God. Consider His acts in creation and in the circumstances of your life. Adore Him. Sing praises to Him. Bless His holy name. Talk to Him and listen to Him. Philippians 4:6-7 Do not be anxious about anything, but in everything by prayer and petition, with thanksgiving, present your requests to God; and the peace of God, which transcends all understanding, will guard your hearts and your minds in Christ Jesus. Petitions to God are for the spiritual, emotional, and physical needs that we face each day. Thanksgiving expresses an appreciation that God is meeting our needs. Seeking God through prayer is also a time to confess our sin, receive His forgiveness, and to intercede for the needs of others. 4. Seeking God with all our heart will drive us into His Word. Reading and meditating on His Word causes us to grow in grace and love and in knowledge of our Lord Jesus Christ. 1 Peter 2:1-3 Therefore, laying aside all malice, all deceit, hypocrisy, envy, and all evil speaking, as newborn babes, desire the pure milk of the word, that you may grow thereby, if indeed you have tasted that the Lord is gracious. 5. Another way we become intimate with God again is by giving generously. This offsets the compulsion to be “rich, and increased with goods”, a state of life that can cool our love for God. Ask the Lord to give you attentiveness to His Spirit as He brings needs to your attention and directs you to meet them with His love and for His glory. As you serve in His name, you will know the joy of the Lord, which is your strength. In summary, if you have left your first love for the Lord, remember where you used to be, recognize your sinful condition, reject your sin, repent by obeying God, and return to the first works of your faith. Jesus is waiting for you to get back to where you once belonged with Him. Isaiah 55:6-7 Seek the LORD while he may be found; call upon him while He is near; let the wicked forsake his way, and the unrighteous man his thoughts; let him return to the LORD, that He may have compassion on him, and to our God, for He will abundantly pardon. Jesus wants to have an intimate, joyful relationship with you. If you have never experienced this, you can today. Believe that Jesus is the Messiah (Christ), the Son of God. Then confess your sin and repent of it by giving your life to Jesus. You do that by dying to yourself and your self-rule in baptism. Then your sin will be forgiven and you will be given a new life, born of the Holy Spirit, who will give you peace, joy, grace to obey God, and power to be a witness for Jesus Christ.